Camino de Santiago. Etapa 3. Zarautz-Zumaia. The dying words of Myrtle Snow from American Horror Story: Coven rang through my head today as I passed through Getaria, a village between Zarautz and Zumaia along the Camino del Norte where there is a museum dedicated to the fashion designer born there. I’ve been wanting to get back on the Camino ever since my two days last August. (You can read about them here and here.) Money and then a horrible bout of depression last autumn that I’m finally coming out of (I hope) have kept me away, but I made a promise to hit the trail again the second there was a bit of good weather. And good weather was had, 20ºC (about 68ºF) and sun. And can I just say how great it was to head back out on the Camino after a long, wet winter? It’s only a week break from before the rain returns, but I’m going to take advantage of it as much as I can. I got off to a late start and didn’t catch the bus that runs from Bilbao to Zarautz until 10:00. It was almost a self-sabotage. I woke up a minute before the alarm, turned it off and slept another hour, then caught the Bilbon Bizi (Bilbao’s bicycle service) and went purposefully slow. The world wasn’t having it though. I bought the last ticket and had to sit in the middle of those five seats, back row on a sold-out bus. I nearly didn’t realise the bus was at a stop, thinking it was at a stop light, before racing to get off the bus before the bus driver left and went on to San Sebastián-Donostia. I am caught up in the world of the Baztán trilogy by Dolores Redondo, which I hope to write about in the future, so I was off in my own world, normal for me. I had a quick second breakfast of tortilla de patata and café con leche, which I ordered in Basque, and saw that it should take about 2,2 hours to Zumaia. 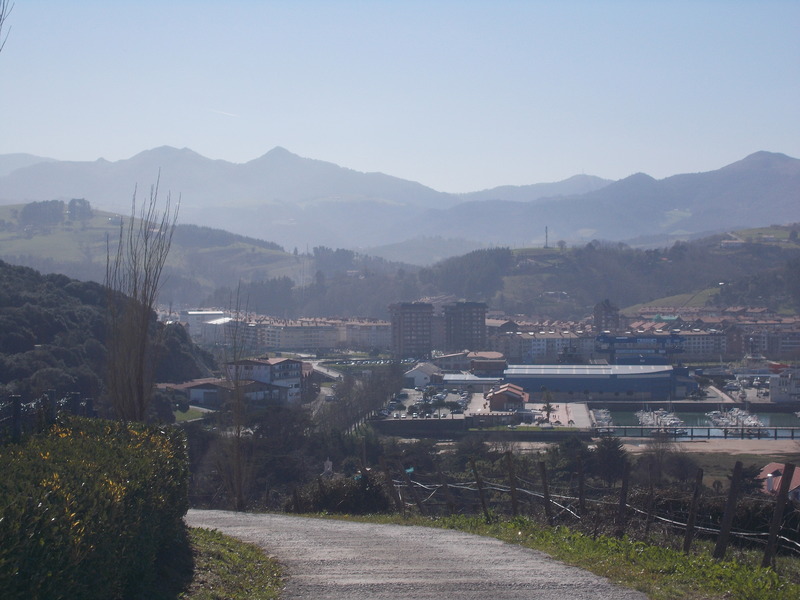 I wasn’t sure if I’d go on to Deba or not, as Getaria and Zumaia were two unknown Basque towns I’ve been wanting to check out. Since we’ve had about 3.5 months of rain with very few breaks, I wasn’t alone in the walk from Zarautz to Getaria. Many people of both towns were taking the coastal walk between the two. I know there is another route of the Camino that takes you through a less-crowded mountain, but I wanted to be on the coast (which is the one recommended for cyclists). I fell in love with Getaria with each step closer. In about an hour I was in the town of the mouse (ratón). I walked around the crowded medieval streets and looked at the Balenciaga musuem (but didn’t enter. I’m a bad gay!). I had another café con leche before hitting the Camino, which was finally looking like a Camino again. Before I knew it, I was in the neighbourhood of Askizu, which consists of a church, a plaza and a bar for peregrinos. I had a quick lunch (bocadillo de chorizo and mosto (grape juice)) and got a stamp and a “buen camino” from the overworked waitress. I thanked her in Basque and was on my way. An older Basque couple from the bar soon caught up to me, and they told me about their experiences on the Camino de Plata, saying it was much harder than the Camino Frances and they hoped to do the Camino del Norte in the future. Super friendly, and I was proud of myself for overcoming some of my social anxiety issues. I was in Zumaia in less than an hour. Zumaia was so incredibly beautiful that I decided to end my day here so I could get to know the town some. It’s famous for its flysch beaches, and at first, I thought…”this is it?” As I looked, these rock formations were really beautiful and unique. I played with a golden retriever on the beach before stopping off at the Oficina de Turismo for the stamp (sello). The woman was like “No puedo con castellano hoy, ¡escribo la fecha en euskera!” (I can’t deal with Spanish today, so I’ll write the date in Basque) to which I say “Eskerrik asko!” (“Thank you” in Basque (Euskera)). Day 4…hopefully soon. Day 3 was too short but amazing nonetheless. ← Cuenca and some hanging houses.